A truly unique reaction trainer. Train not only the reaction but the action that follows. 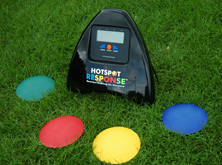 Four coloured spots correspond to lights on the base and can be set out in any configuration and pattern. Totally portable system – use inside or out. 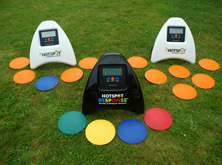 Vertical jump height measurement and agility movement training in one system. Four standard spots and a fifth spot configured for jump height testing. Simple and quick to set up – all your testing and training needs in one single system. 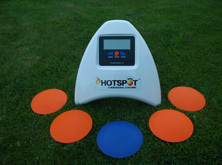 Standard HotSpot system with six spots for all agility, movement training and fitness needs. Having six spots means total versatility for all training in all sports with endless patterns and shapes to replicate real game movements. 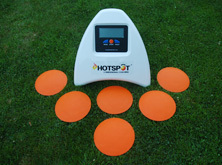 Need a special combination of spots and bases? Or maybe a totally unique set up for your training? Let us know your budget and we can design a configuration tailored to your exact needs giving you the perfect system designed just for you.